One of the longest lasting acts in rock history, spanning fifty five years from its birth in 1947 to the death of its remaining founding member in 2002, The Treniers were at once unlike any other rock artists yet still incredibly influential. The group began initially in the swing era with just two identical twins, Cliff and Claude Trenier, born in 1919 Alabama. Claude was encouraged to go to Alabama State Teacher’s College which was known for its top-notch band, The Bama State Collegians, founded in part by future rock artist Manhattan Paul Bascomb in the late 1920’s. Claude then recruited his brother Cliff to join him and they cut their teeth playing with the band before the school kicked them out in 1941 for accepting other gigs rather than the ones the college had booked them for. Soon Clude got a job singing for Jimmie Lunceford, the innovator of swing and one of the top flight groups in the country. Cliff joined him and they perfected their “twin” routine, wherein one would sing, then exit one side of the stage then the other would reappear on the other side a second later dressed the same. The gimmick was very popular, helped by the fact both could sing well, but after returning from a wartime stint in the service they eventually got the boot there because Lunceford found Claude couldn’t read music – he’d simply used his ear and natural affinity for picking up the song by listening to the rehearsal and memorizing the arrangement and Lunceford was a stickler for having musicians who read. 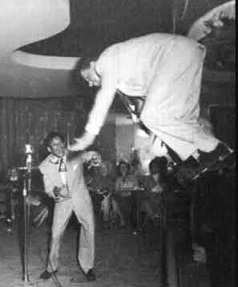 Claude got a job at the Club Alabam in Los Angeles and when Wynonie Harris left he took over as the primary vocalist, working with Johnny Otis’s crew. Eventually Claude and Cliff got back together and set out on their own along with musicians they’d played with in the Bama State Collegians, including saxophonist Don Hill and pianist Gene Gilbeaux, securing the first recording contract as a featured act, dubbed The Trenier Twins. Their manic on-stage routine – part humor, part music – didn’t quite translate to their early records, despite material that might’ve been adapted for it well, as Claude was still leaning more towards crooning ballads while Cliff’s joking antics attempted to disrupt it. Failing to connect with this at the dawn of rock in 1947/48 they spent more than a year on the road honing their act before getting a second chance. 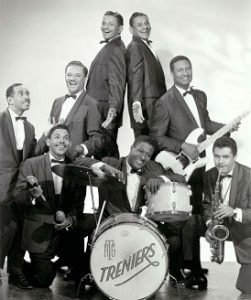 When they got another recording contract with OKeh, they’d added two other brothers Buddy and Milt, changed the name to simply The Treniers and most importantly they shed their balladry and focused on rocking exclusively while still maintaining the comedic touches and the frantic visual stage act. Though it’s widely felt, including by the group themselves, that they were never quite able to capture their best work on wax, as even in the studio they had to move around too much in order to really get into the spirit, their records were solid sellers nonetheless and spread the word of their live performances which remained their calling card. The group was so unique on stage, featuring non-stop movement, showy displays (Gilbeaux playing piano while his feet were in the air, Hill’s wild sax playing, the brothers jumping around like maniacs, all while still performing a coherent song) emphasizing their energetic music that they were able to appeal to adult nightclub audiences who wouldn’t otherwise deign to listen to rock music. And because they could be presented as a visual team as much as a musical one they made inroads that other rock acts benefitted from, most notably in television, as in the early 1950’s they broke down barriers for rock ‘n’ roll by appearing on The Ed Sullivan Show, Jackie Gleason, Martin & Lewis and Red Skelton shows while other rock acts were decidedly off-limits to producers. Their stage show also influenced the likes of other artists who incorporated some of their style into their own act, as Bill Haley’s Comets were huge fans of the group and borrowed a lot of their act, and in return Haley gave The Treniers a song he’d written called “Rock A Beatin’ Boogie” which became one of their signature numbers. The Treniers also were the first to stage dive years before it became commonplace and their appearances in rockploitation films such as The Girl Can’t Help It captured their frenetic energy for posterity. By the late 1950’s when they should’ve been slowing down, nearing 40 years of age and performing a style aimed at audiences half that age with a stage act that was more physically demanding than most, they shifted their focus back to live gigs and became the first rock act to successfully conquer Las Vegas, as once again they were able to break through by having the casinos and their clientele view them as a visual act as much as a musical one. Yet they were still potent enough to blow younger rock artists at the peak of their popularity off stage when they’d venture out to do multi-act rock shows. The group settled into a routine of Vegas and Atlantic City by the next decade and twice were named Las Vegas Entertainers Of The Year, but the sudden death in 1982 of Cliff Trenier, who’d long played the role of jester, both on stage and record, using female voices, playing different parts in skits and constantly upstaging Claude as he tried to sing, put their future in doubt. With Milt long since departed for a solo career, they’d added nephew Skip in 1959 but without the twins the act seemed to be over. Skip then stepped up and took Claude’s role as the primary vocalist while Claude handled Cliff’s routines and they never missed a beat, their longtime musical lynchpin, Don Hill, remaining as the musical centerpiece until Claude finally passed away in 2002.